"The Drum Music collective's session is a non-stop mix of roots and dance music. Each act bringing you a fresh set of floor fillers old & new. Positive vibes and a friendly atmosphere for all people." LOST PROPERTY - Down Tempo (21:21 - 23:00) Tearing through old and new reggae inspired Jungle classics. LONGSHOT - Reggae (23:00 - 00:00) Old and new concious Roots, Bass & Culture. 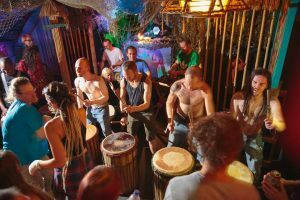 TANANTE - West African Drumming (00:00 - 00:30) Possibly the best African Drumming band in the UK! RUFMOUTH - Old Skool Party Vibes (00:30 - 01:30) Jeep Beat Collective, Godfather of Wierd, Mind bomb. Ruf will be paying his respects with a set from days gone by. FIBRE - D&B/Jungle (01:30 - 02:30) Dropping your favourite mix of bangers old and new! KEN EVIL - Bass Music (02:30 - 03:33) The unstoppable evil man. Mashin your mind and body with the latest releases.